Archbishop Thomas Wenski describes the priesthood as a constant state of sacrifice. Which is not to say that he regrets any of his more than 40 years in ministry. A lifetime of giving certainly has not diminished Archbishop Wenski’s sense of humor. He loves to joke (in three languages), rides a motorcycle for relaxation and has been known to puff on a cigar now and then. Born in Lake Worth, Florida, the blond, blue-eyed son of Polish immigrants, he speaks Spanish like a Cuban, Creole like a Haitian and, ironically, only “limited” Polish. He first thought of becoming a priest as a third grader at Sacred Heart School in Lake Worth and entered St. John Vianney Seminary in Miami at age 13. He learned Spanish from classmates there and at St. Vincent de Paul Regional Seminary in Boynton Beach, as well as by listening to Cuban radio stations and hanging out in Hialeah and Little Havana. Ordained in 1976 by Miami’s first bishop, the late Archbishop Coleman F. Carroll, Archbishop Wenski thought he would be working with Hispanics all his life. Then he arrived at Corpus Christi Parish in Miami’s Wynwood section and found a group of 40-50 Haitians who gathered regularly for Mass and prayer. “They filled that church with song,” he recalled. His conviction that every group needs to be ministered to in its own language compelled him to back his words with actions. So he took a course in Creole, and when Archbishop Emeritus Edward A. McCarthy found out, Archbishop Wenski’s fate was sealed. After spending a summer in Haiti learning Creole, he spent the next 18 years working with Miami’s growing Haitian community, a role which made him concurrent pastor of three missions: one in Miami, one in Fort Lauderdale, another in Pompano – all of which he founded. He often traveled as far away as Winter Haven, Fort Pierce and Immokalee to celebrate Mass with Haitian communities, a commute which spurred him to earn a pilot’s license. His ministry also included frequent visits to the Krome Avenue Detention Center, where newly-arrived refugees often languished for months. Archbishop Wenski quickly became known as an outspoken advocate for Haitians not only within the Church but in the community. The Pierre Toussaint Haitian Catholic Center, which adjoins Notre Dame d’Haiti Mission in Miami, provides day-care, English classes, legal advice and job referrals to Haitian immigrants. As if his duties as a circuit-riding pastor were not enough, he learned desktop publishing and single-handedly put out the nation’s first Creole-language newspaper, Lavwa Katolik (The Catholic Voice). In 1993, he also earned a master’s degree in sociology from Fordham University. The archbishop traces his strong convictions on social justice issues to his upbringing as the child of Polish immigrants and the word made famous by a Polish pope: Solidarity. “I come from very simple stock,” he said, joking that Lake Worth is a far cry from West Palm Beach, let alone Palm Beach. His father worked with his hands, “he had callouses and sunburn” and he drank beer, not cocktails. In 1996, that meant even Cubans on the island. Despite loud objections from some in the exile community, he spearheaded a relief operation that delivered more than 150,000 pounds of food to Caritas Cuba for distribution to people left homeless by Hurricane Lily. It was the first time that Miami’s Cubans had undertaken such a humanitarian relief effort for their compatriots. 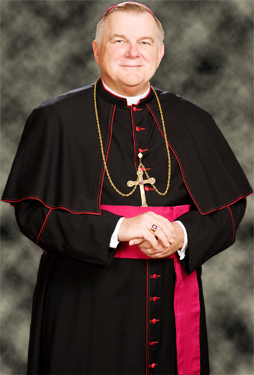 Becoming auxiliary bishop of Miami in 1997, and subsequently being named head of the U.S. bishops’ Committee on Migration, allowed Archbishop Wenski to broaden his advocacy. In 2003, the committee and its Mexican counterpart published “Strangers No Longer: Together on the Journey of Hope,” a first-ever joint pastoral statement urging better treatment of Mexican immigrants in the U.S. Archbishop Wenski also has traveled as far away as Korea and the Congo to study the plight of refugees. And he has been heavily involved in PROCHE, the international Partnership for Church Reconstruction in Haiti in response to the January 2010 Port-au-Prince earthquake. After being named coadjutor bishop of Orlando in 2003, and taking over as bishop in 2004, Miami’s “native son” returned to South Florida in 2010 as the archdiocese’s fourth archbishop. He quickly moved to reopen some parishes that had been closed due to the 2009 financial crisis, and launched a second archdiocesan synod in 2012. It concluded in October 2013 with a Strategic Pastoral Plan which began to be implemented in 2014. He continues to speak out as strongly for immigrants as for the unborn, and urges Catholics to set an example of holiness in a world full of outrage and divisiveness. October 18, 1950, West Palm Beach. Son of Chester S. Wenski and Louise M. (nee Zawacka) Wenski. One younger sister, Mary Engle. To the priesthood, May 15, 1976, for the Archdiocese of Miami. Appointed Titular Bishop of Kearney and Auxiliary Bishop of Miami, June 24, 1997. Consecrated to the episcopacy September 3, 1997. Appointed coadjutor bishop of Orlando, July 1, 2003; succeeded Bishop Norbert Dorsey upon his retirement, Nov. 13, 2004. Appointed Archbishop of Miami, April 20, 2010. Installed as fourth Archbishop of Miami, June 1, 2010. Served as Apostolic Administrator, Diocese of Pensacola-Tallahassee, March 2011-June 2012. He is the only Florida native serving as a bishop in the state. Sacred Heart School, Lake Worth. St. John Vianney Seminary, Miami, Associate in Arts (1963-1970). St. Vincent de Paul Regional Seminary, Boynton Beach, Bachelor in Arts (1972); Master of Divinity (1975). Catholic University of Lublin, Poland, summer courses in Polish language and culture (1981, 1983). Fordham University, Master of Arts in sociology (pastoral planning) (1992). Languages spoken: English, Spanish, Haitian Creole, some Polish. Parochial vicar, Corpus Christi, Miami (1976-1979). Summer studies in Haiti (1979). Associate director, Haitian Apostolate, Miami (1979-1985). Associate rector, St. Mary Cathedral, Miami (1981-1984). Director, Haitian Apostolate (1985-1998); includes Pierre Toussaint Haitian Catholic Center, Miami, and circuit-riding ministry that establishes Haitian communities from Homestead in the south to Fort Pierce in the north, Immokalee in the west and Fort Lauderdale in the east. Pastor, Notre Dame d’Haiti Mission, Miami (1985-1998); and concurrently, pastor of Divine Mercy Mission, Fort Lauderdale (1987-1997), and St. Joseph Mission, Pompano Beach (1991-1997). Coordinator, Ministry to Cultural Groups (1990-2003). Director, Catholic Charities of the Archdiocese of Miami (1995-2003). Archdiocesan director of Catholic Relief Services, the Catholic Campaign for Human Development, Disaster Relief, Catholic Commission for Social Advocacy, and Ministry to Sexual Minorities (1996-2003). Other appointments: Archdiocesan Committee on Popular Piety and Presbyteral Council; secretary of the Catholic Community Service Board, Catholic Child Welfare Trust Board and Catholic Family and Children’s Services; Archbishop’s representative to the Greater Miami Religious Leaders Coalition and the Board of Directors of the Florida Loan Fund. Board member, CLINIC - Catholic Legal Immigration Network, Inc. (chair, 1998-2001). Member, U.S. bishops’ Committee on Migration (chair, 2002-2004). Consultant, U.S. bishops’ Committee on International Justice and Peace (chair, 2005-2008). Member, Committee on Domestic Justice and Human Development (chair, 2013-2016). Member, U.S. bishops’ Subcommittee on the Church in Latin America . Consultant, U.S. bishops’ Committee on Pro-Life Activities. Board member, Catholic Relief Services. Board member, Catholic Leadership Institute, “Good Leaders, Good Shepherds” . Board of Directors, St. John Vianney Seminary, Miami. Board of Trustees, St. Vincent de Paul Seminary, Boynton Beach . Board of Directors, Sts. Cyril and Methodius Seminary, Orchard Lake, Michigan. Member, Scalabrini International Migration Network Advisory Committee . Board member, The Catholic University of America (2009-2017) . Chair, U.S. bishops’ Committee on International Policy (2004-2008). Member, Governor’s Task Force on Haiti (2004-2005). Board member, Florida Council on Homelessness (2001-2004). 1975: Seminarian of the Year, Archdiocese of Miami. 1987: St. Vincent de Paul Regional Seminary’s annual award to outstanding priests, for his “apostolic zeal and multicultural openness.” He was only the third recipient of the honor and the first seminary alumnus to be so honored..
1994: Charles Whited Spirit of Excellence Award, from The Miami Herald. 1996: Father Moczygemba Award from National Polish American Priests’ Association. 2008: Outstanding Community Service Award, UCF-Global Connection Foundation. Honorary doctorates: Barry University, Miami Shores,1997; St. Leo University, St. Leo, Florida, 2004.